Gagosian London is pleased to present “Circling”, an exhibition of Giuseppe Penone’s monumental works Scrigno (Casket) (2007) and Sigillo (Seal) (2008). In sculptures, drawings, photographs, and installations, Giuseppe Penone heightens the subtle levels of interplay between man, art, and nature. 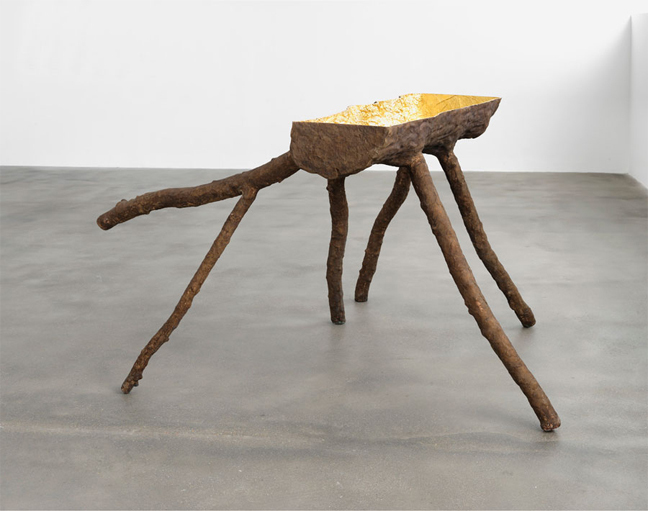 His work represents a poetic expansion of Arte Povera’s radical break with conventional media, and emphasizes the involuntary processes of respiration, growth, and aging that are shared by man and tree. In each of the large-scale works that comprise the exhibition, an artistic gesture is crafted upon a natural foundation. 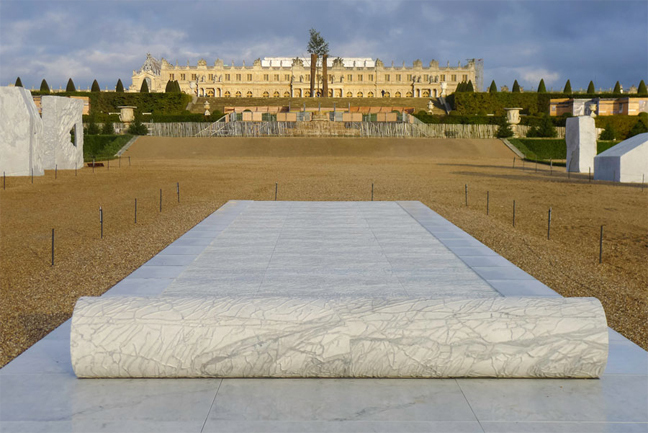 Sigillo (Seal) (2008) – which was included in Penone’s major installation at Château de Versailles in 2013 – is a horizontal veined marble slab almost twenty meters in length. Across its mid-point, a solid cylinder of the same marble evokes the ancient Babylonian seals used to make impressions in clay, linking a man-made tool to the endless swirling pattern that was in fact produced by geological events over millions of years. 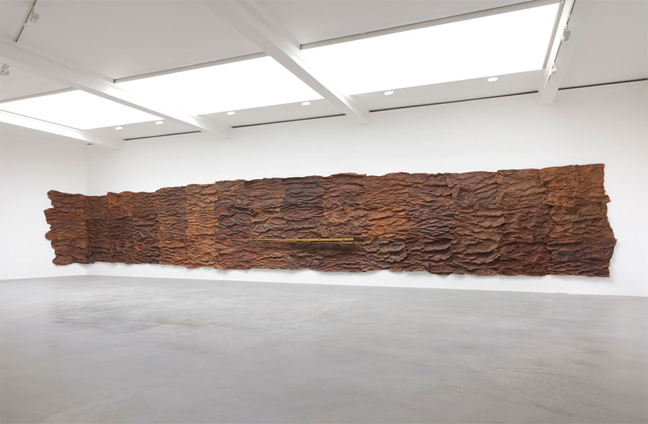 Scrigno (Casket) (2007) is a patchwork mural of overlapping sections of weathered brown leather. Moving around a living tree, Penone hammered the leather against it to impress the bark’s natural pattern and texture onto every square inch. 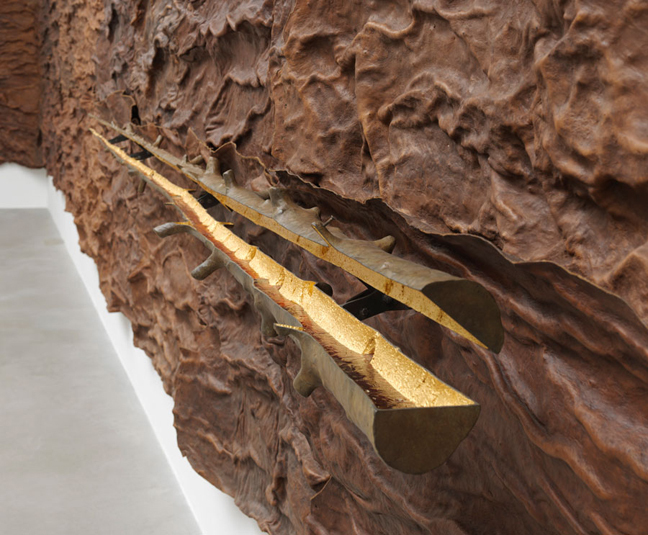 Across the center of this vast work, which measures approximately fifteen meters in width, lies a small tree cast in bronze, split open to reveal its rich resin interior. Engaging with and subtly intervening in the natural world so as to reimagine it, Penone finds ever new ways to harmonize elemental occurrences with his own artifice.